Fresh Egg Grain Free & Keto Pasta 🍝 Just 4g net carbs a serving! This fresh egg keto pasta (or fried gnocchi!) is surprisingly easy to whip up! And while different from the original, it still yields killer al dente-like results. Because pasta. One of the things most peeps understandably miss the most when going keto, or grain free for that matter (🙋🏿!!). Because let’s face it, not much beats a bowl of pasta. And while this low carb version is a little different (think fried pasta/gnocchi), fairly certain you’ll be surprised by the al dente-like results and wonderful pairing with traditional Italian sauces. Plus, while it can take about an hour to put together (counting resting time and depending on the amount to shape), think of it as meal prepping supreme. The pasta can be cooked after briefly thawing it out, making it ideal for a quick weeknight meal. 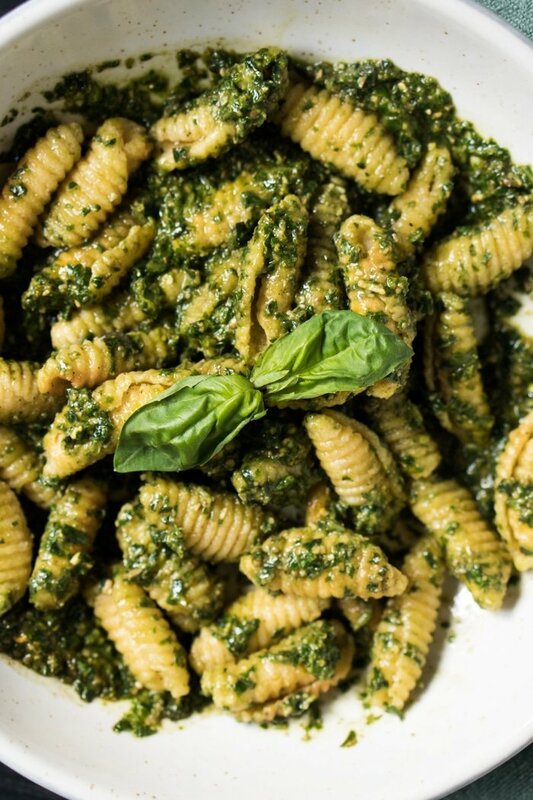 Oh, and for killer and easy sauces look no further than our easy-peasy keto pesto or marinara sauce. 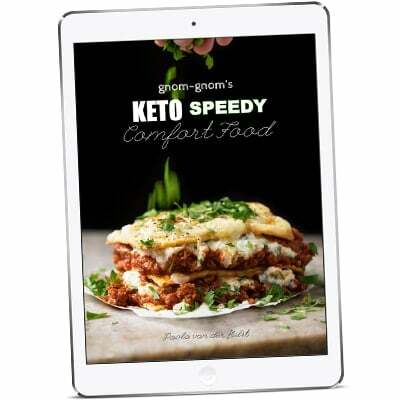 You have encountered the base dough already in our grain free keto tortillas and subsequently in our keto ravioli. Think almost the same ingredients: almond flour, coconut flour, a touch of xanthan gum and an egg. But slightly wetter, allowing for better rolling and cooking. Fact is, the recipe for this keto pasta is very similar to the staple fresh egg Italian. Think roughly a cup of grain free flours per egg, and a little water as needed. This pasta dough is, perhaps surprisingly, very easy to shape (particularly with a little practice!). I timed myself (Paola here!! 🙋🏿) and it took me 30 minutes to shape cavatelli and 20 for the orecchiete and farfalle. And maybe I’m into manual work, but I’ve always found making homemade pasta to be ultra relaxing. 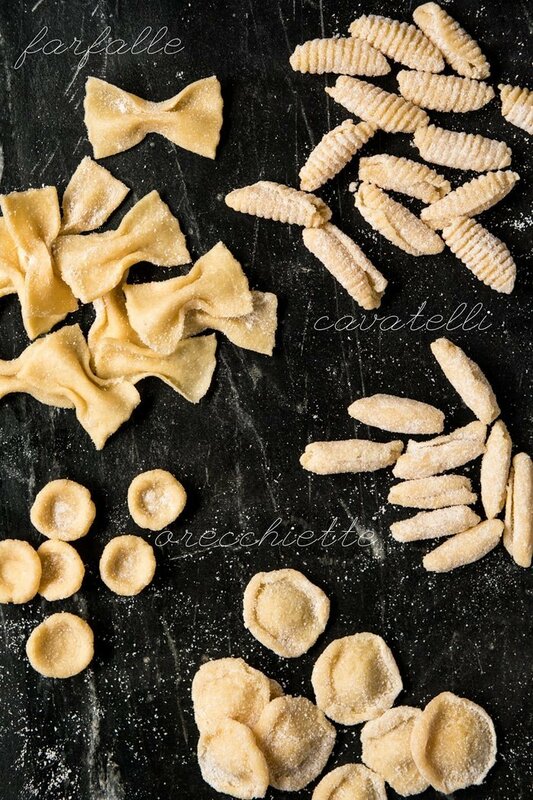 Must say, however, that the shape of choice (for most pasta-like results) are the cavatelli. Both because the ridges help the sauce to stick better, and for the resulting texture and mouthfeel. Though you’ll need to procure a (9 bucks!) cavatelli & gnocchi board. 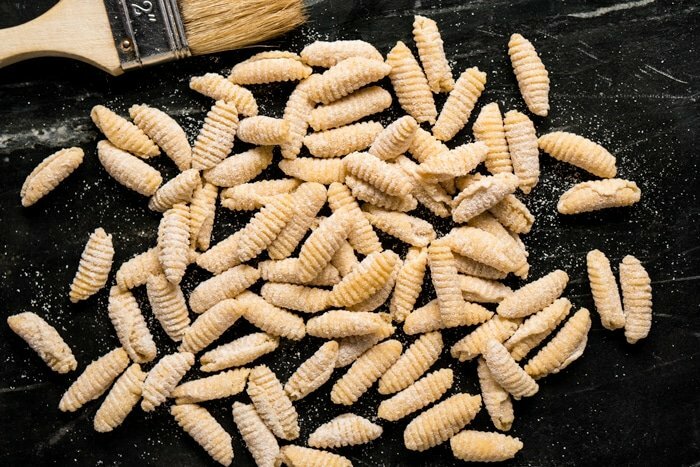 Cavatelli are very similar to gnocchi in shape (which you can make too! ), though slightly thinner and with more of a bite. Otherwise orecchiette and farfalle (i.e. butterflies or bows) are super easy to make, and yield wonderful results too. And, as previously mentioned (and many of you know already! 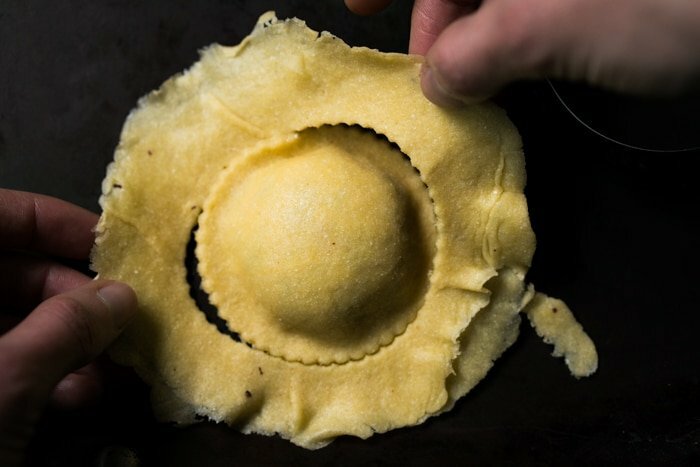 ), you can make killer ravioli with this dough. 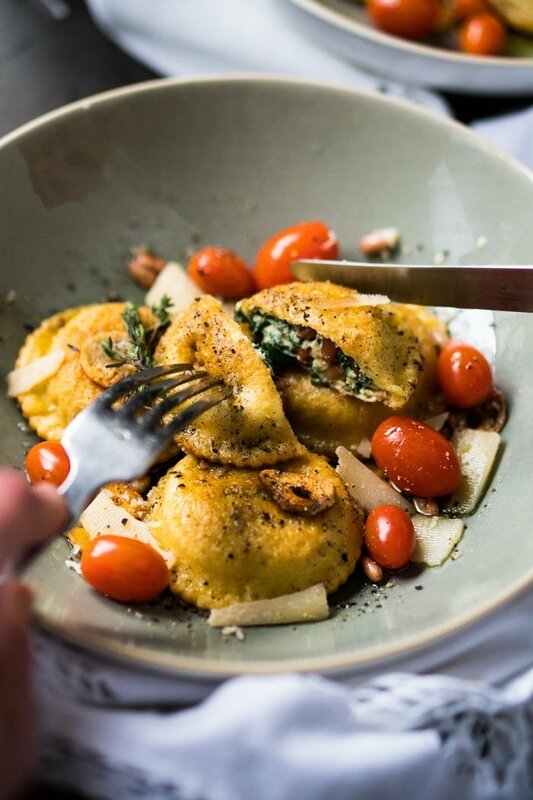 Check out the full ravioli recipe post for deets and tips! The trick to even shaping? Divide the dough in four, roll into a log and slice off pieces (see picture below). This is a traditional Italian method to ensure even-sized pasta. You’ll want to freeze the shaped pasta for 15 minutes prior to cooking. And yes, you can go ahead and freeze them too (think a couple months), but thaw them out slightly before cooking. You’ll also want to always cook these guys in a little olive oil or butter, never in water (they’ll just be mushy as keto flours cook very differently). But they’re absolutely killer lightly fried. Though be sure to only cook this low carb and keto pasta until it just begins to get some color. We found this is the best way to get an al dente-like texture. Soft, but with a nice bite. This fresh egg keto pasta, also dairy and grain free, is surprisingly easy to whip up. And, while different from the original, it still yields killer al dente-like results. If no food processor is at hand, you can also do it by hand (it just takes a little more time and arm muscle!). Add all the dry ingredients to a large bowl and whisk until thoroughly combined. Pour in vinegar and whisk until thoroughly distributed. Pour in egg while whisking vigorously and keep whisking until the dough becomes too stiff to whisk. Using your hands, knead the dough until thoroughly incorporated, adding a teaspoon of water at a time as needed (we use 2). Wrap dough in cling film and knead it through the plastic for a couple minutes. Think of it a bit like a stress ball. Allow dough to rest for 30 minutes (and up to 5 days) in the fridge. Farfalle (i.e. 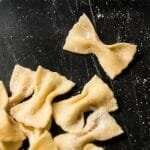 bows) and orecchiette are probably the quickest shapes to make. 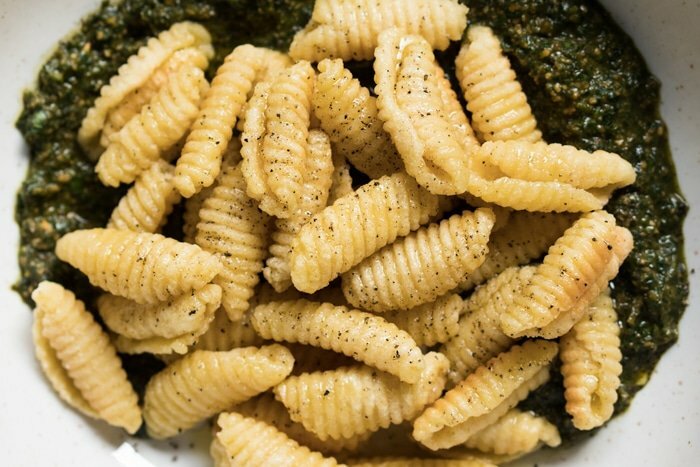 Though cavatelli might just be our favorite, but you'll need a board (see special equipment for details). 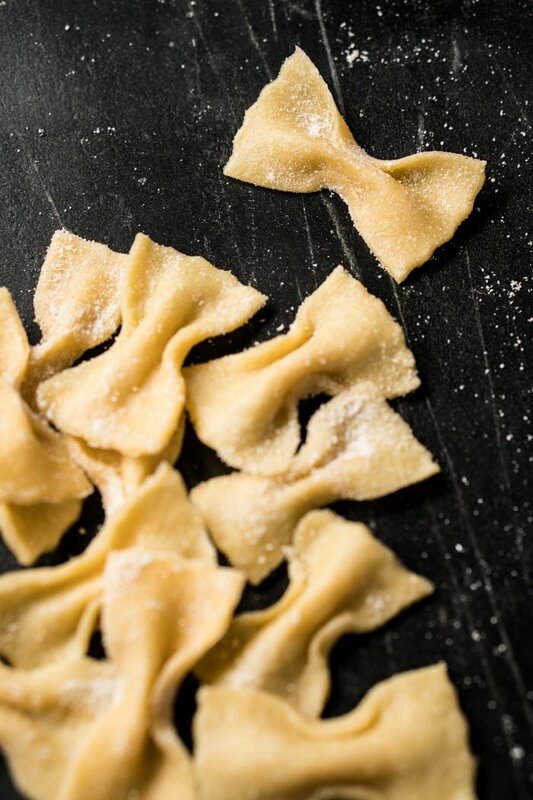 For farfalle: roll out the pasta to its thinnest point using a tortilla press between parchment paper (our favorite) or a pasta machine. You can also use a rolling pin, but it'll take a little longer. Cut into roughly 2x1-inch rectangles. And if you're fuzzy about presentation, use a knife to cut lengthwise and a pastry cutter to cut widthwise. For orecchiette: cut dough into 4 pieces, roll out into even-sized logs and slice off even-sized pieces. This will ensure evenly-sized pasta. Using your thumb, press each piece against your opposite palm, creating an indentation. Lightly dust with coconut flour as needed. You can either leave them as they are or turn them out (see post for gif images). 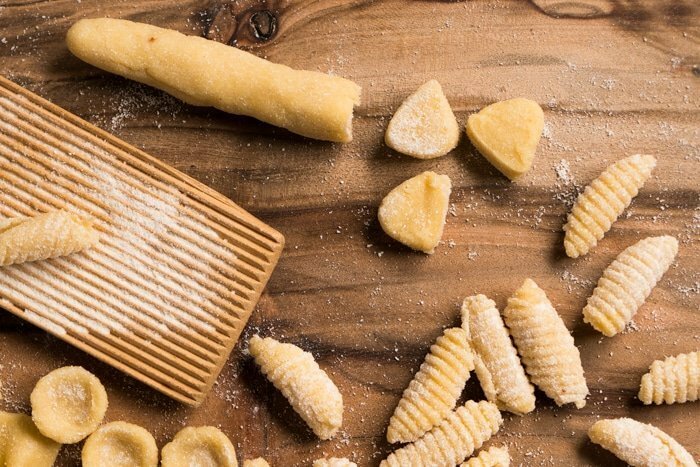 For cavatelli: cut dough into 4 pieces, roll out into even-sized logs and slice off even-sized pieces. This will ensure evenly-sized pasta. Lightly dust the board and pasta pieces with coconut flour. Place a piece on the board and using a knife press the dough towards you, angling the knife tip upwards as you press (see post for gif images), making the pasta curl into shape. Place shaped pasta in the freezer for 15 minutes (and up to a couple months). Heat up butter and oil in a skillet or pan over low heat. Once warm, add in garlic slivers. When the garlic begins to brown, add in chilled pasta and baste right away. Cook pasta until it just begins to get some color, we found this gave the most 'al dente' texture (soft but with a bite). Feel free to make a test with one piece. Serve right away with toppings of choice. Feel free to go ahead and freeze the pasta, but you’ll want to thaw it out slightly before cooking. This recipe yields roughly 200g of pasta. We calculated nutrition facts for a 50g serving (4g net carbs), keeping in mind that this keto pasta is quite a bit more filling than the traditional. is it possible to do with all almond flour/no coconut flour? does anybody know how that might come out? i have everything else i need and am feeling lazy about going to the store. I was worried. I read my ingredients and follow the instructions to the letter. I made the little bow ties. I put them in the freezer for 15 minutes and I fried them in garlic and olive oil. They were so good. I think they would definitely stand up to any sauce that you added to them (after they were fried) I can’t wait to try them as fried ravioli. I’m also going to stuff a few with ricotta and sauerkraut, fry them, dress them with sour cream, and call them a pierogi. I read in the comments that you wouldn’t recommend this for egg noodles. Can I put this through my pasta extruder make spaghetti or macaroni, etc? Hi.. I printed this and can’t wait to make this! Can you tell me.. I have an Italian pasta machine… can I use that to roll out the dough.. and then use it to make fettuccine and spaghetti with?? Or only use it to make the shapes that you have suggested?? These made Great Breakfast Skillets!!! My husband can’t tell they are not potatoes!!! Thank you for all of your recipes !!!! I used a rolling pin to flatten out my pasta, so that might have been my problem. I cut them like egg noodles. When I fried them up, they puffed up more than I expected, and they really resembled french fries, even the soft texture was very reminiscent of them. The only thing missing was the salt, and ketchup. I don’t think I will try this again. Hi, my dough tastes a lot of almond. Does anyone have any tips for spices that would mask this, or anything I could do differently with the next batch? I also found that is crumbled and was hard to shape. Any tips? or explanations for what could be wrong? Mine turned out more like little pieces of bread, rather than pasta, but it was still super tasty, and will have a lot of utility for me in the future. That pasta looks super fresh and delicious. Hi all, keto here. This recipe “works” fine. I formed cute little cavatelli by pressing/rolling little cylinders of the dough off the tines of a fork. I fried them as directed and they kept their shape perfectly during frying and saucing. But the texture was still mush to the tooth. Also the coconut taste is present on the tongue, even though I cheated and floured the fork and my thumb with AP flour while forming the cavatelli. The coconut taste clashed with my bolognese sauce. Ime you can probably just use fathead pizza dough which has no coconut flour. I made a test gnocchi with tonight’s pizza… turned out great. YOU HAVE SUCH GREAT RECIPES!, COULD I MAKE THIS DOUGH INTO LASAGNA SHEETS?. 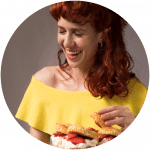 Are there any lower carb flours you could use that are not as sweet as the almond and/or coconut flour?